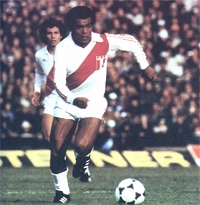 Teofilio Cubillas played in two World Cups eight years apart and scored five goals in each, making him one of the most prolific scorers in World Cup history. A virtually unknown 20 year old in 1970, he was soon acknowledged after helping Peru to the quarter- finals. "Nene" Cubillas was born at Lima in March 1949 and began with local team, Alianza. He liked to run at defences, was fast and had good close control and a fine shot. South American Footballer Of The Year in 1972, the following year he joined FC Basle for £97.000. Six months later he signed for FC Porto, for £200.000, and settled into a midfield role. 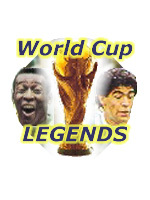 Peru did not qualify for the 1974 World Cup, but 12 months later they were South American champions, Cubillas scoring twice in their 3-1 first leg semifinal win over Brazil. When he helped Peru reach the second phase of the 1978 World Cup, he was an Alianza player again. In 1979, Cubillas joined George Best at Fort Lauderdale and in five seasons in the NASL scored 65 goals, including three in seven minutes against Los Angeles Aztecs in 1981. The 1982 World Cup failed to produce any more goals for him and he bowed out after 81 caps and 26 goals for Peru.